Like always, I began the week with another great group of kids!!! We had perfect weather and perfect water conditions and boy were we ever ready to go have some fun!!! Like Fun all the way from here to there kind of FUN! Just the way I LOVE it! We spent the first morning visiting the Rock Garden and having a ball finding all kinds of things! There were so many fish in every direction we didn’t know which way to start swimming. Parrotfish, snappers, grunts, seargent majors, porkfish, barracudas, wrasse and snook! Everywhere!!! 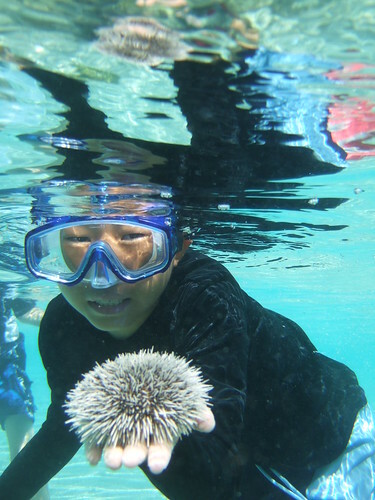 While we were looking at fish, AdventureDakota found a Big Sea Urchin which we all checked out and AdventureRocky found a nice one too. 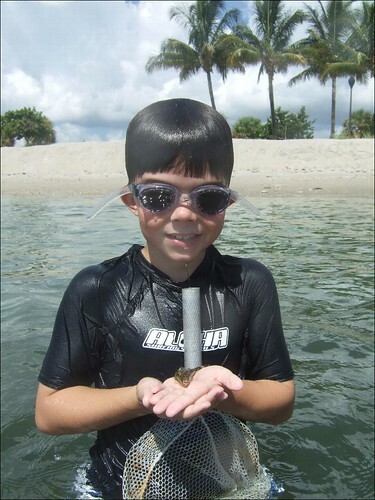 This photo of Rocky with a nice sea urchin shows you just how much fun we were having! 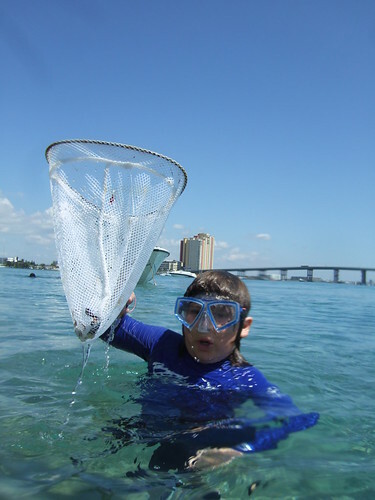 We spent a lot of time looking for new things and catching blennies, gobies, beau gregories, flounder, brittle starfish, short nosed pufferfish and conchs, etc. in our hand nets. It didn’t take long for everyone to get the hang of it! The kids would work together corralling the fish and before long someone had it in their net. 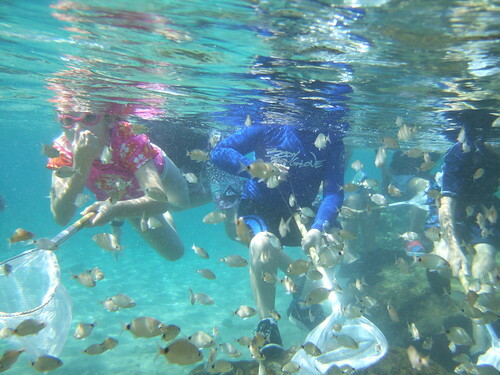 The schools of fish were thick near the shallow rocks and this kept the kids busy for quite some time. Nobody wanted to give up! They were too busy having FUN chasing fish at the Rock Garden!!! After one of the kids turned over a rock and found a Big swimming crab hiding underneath, fish chasing turned into crab catching and off in that direction we went for a while. We didn’t care what we were doing, but boy were we ever having fun and keeping busy doing it all the same! Almost every single rock we looked under we found ourselves staring eye to eye with a nice BIG swiming crab, stone crab or coral crab! 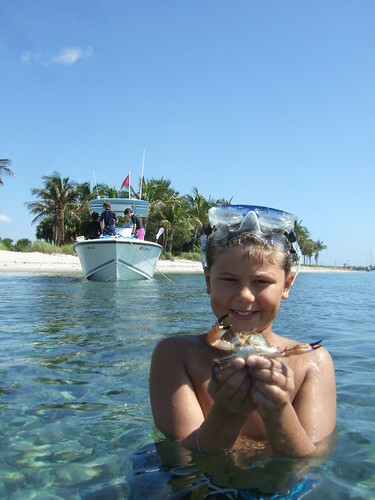 We even had schools of sheepshead and parrotfish following us around trying to eat the crabs we were finding out from underneath our fingertips. Were we ever loving that!!! It was cool to see!!! 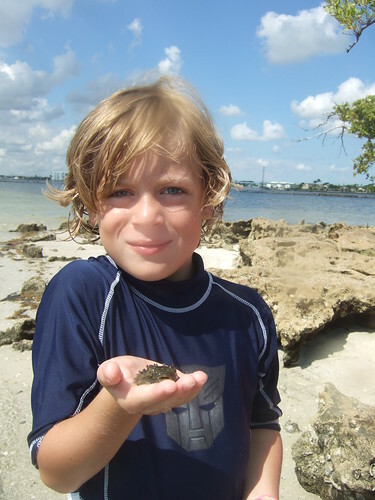 I watched AdventureJagger chase down a nice BIG crab and finally catch him and hold him up for all to see. Nice Job, and not getting pinched either!!! Alright! I watched as AdventureMaxwell perfected a fine technique of turning up a rock and snagging a Big Crab in his net all in one swift motion. That is not as easy as it sounds. These crabs have a habit of rapidly swimming under the next rock nearby or right under your feet before you can blink your eye! Sometimes they swim right under the next kids feet before they know whats going on, and that sure can get things exciting in a hurry. You should have heard the squeals of laughter when that would happen! We all loved it!!! Another day we stopped by the Big Sandbar to look for mantis shrimp, fighting conchs, blue claw crabs, hermit crabs and anything else we could find to check out up close and personal. It didn’t take us long to find something we loved! We always love coming here and seem to come up with underwater “treasures” on every occasion. On this day I re-learned that important lesson why you should NOT wiggle your finger in the hole of a nice big mantis shrimp to see what might happen! And that’s because he might think its a fish and reach out quicker than you can imagine and grab that nice little finger with his sharp dagger like claws before you can move it!! When I pulled my finger back bleeding with 2 nice punctures in it, the kids thought that was just GREAT!!! I’m sure they learned an important lesson and so did I!!! AGAIN… ouch! When will I ever learn? 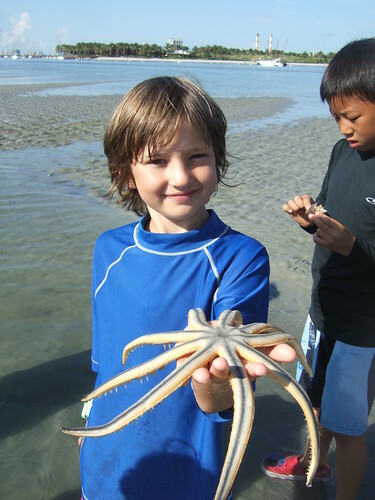 One of the neatest things AdventureBeau found was a nice big 9 armed starfish that he shared with all of us, and we loved that too!!! Good JOB! We spent one afternoon seine netting in the shallows and grass flats around Little Munyon Island. The kids always love this and you never know what you might come up with! We find so many cool things from juvenile barracudas to dwarf sea horses to sharp nosed pufferfish. You name it and I think we might be able to find it! Each time we pulled the net we found something new to share! 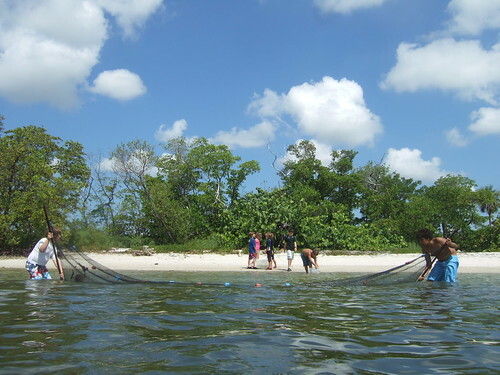 On this day the tide was extra low and we had a chance to seine net in places we weren’t able to before. It was just great! 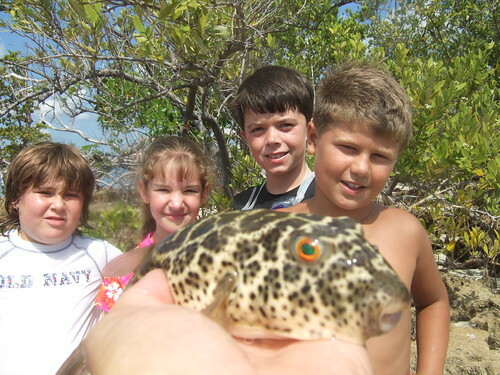 On one pull of the net on to the beach we came up with a lovely checkerboard pufferfish that everyone wanted to see! thes fish are commonly in the shallows eating barnackles off the rocks but aren’t easy to get in a seine net. I showed them the powerful jaws and dentures that these fish posses and made sure no one held this fish but me. Didn’t want anyone to get nibbled on. They are capable of giving a nasty bite if you by chance mistakenly slip your finger in their mouth when you are not paying as close attention as you should be. I’ll bet you would never guess how I found that outlong ago… ouch again… Needless to say we loved checking out this checkerboard pufferfish and his toothy dentures! Thursday was our fishing day and as usual we caught fish almost non stop! The most common thing I heard all day was, “AdventureMike I need more BAIT!! !” And let me tell you I heard that before!!! We spent a little bit of time fishing the artificial reef and caught porkfish, grunts, tomtates, porgies, parrotfish and more. I decided to run down to my snapper hole and before long everyone was catching some nice BIG snappers! And I mean one right after another!!! 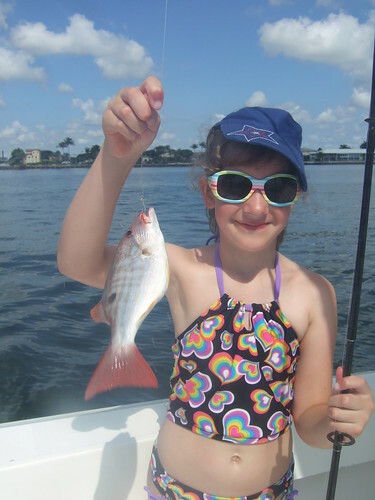 Over and over and over… AdventureSamantha sure had FUN fighting and catching this nice BIG one all by herself!!! YOU ROCK! I’m not sure how many snapper we caught here, but it seemed to many for me to keep count!!! A few of the kids caught some nice big porgies and they had to work hard bringing those fish in on light tackle! A few times I heard the kids say their wrists were getting tired from reeling in so many fish and thats a “complaint” I love to hear!!! It seems our fishing day is always like this! 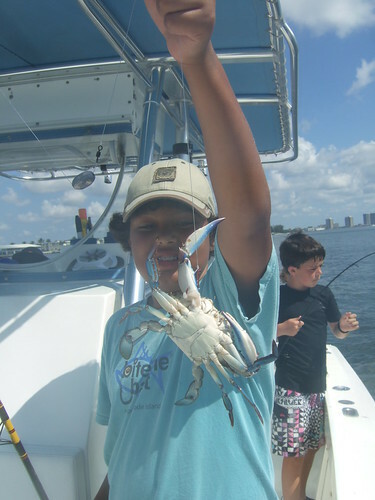 On one occassion AdventureDakota came up with a nice BIG blue claw crab hanging on his bait and thats the first one anybody has caught during my summer camp! Lucky for us he let go on his own and fell over the side to swim away! Nice catch Dakota! The last day we spent a bit of time swimming at the Rock Garden chasing more fish and darting after swimming crabs and having so much fun trying to catch sharpnosed pufferfish when we would see them. When first spotted they don’t appear to be able to swim fast but don’t be fooled by their diminutive size. They can dart away quickly and disappear before you can say, “Where did he go?”. That happened more often than not!!! AdventureMichael came up with a nice one and everyone loved watching it puff up to more than twice its size!! We ended the day going back to Little Munyon Island and walking around in the shallows finding thousands, and I mean thousands of short spined sea urchins, hundreds of hermit crabs and juvenile blue crabs and a few beaded starfish that everyone loved to see! The tide was so low we had a chance to walk all the way around the island and look for shells and what ever else we could find. AdventureJake came up with a juvenile striped burrfish that had short little spines on top and blue and yellow polka dots on the bottom, and let me tell you we ALL loved that!!! Nice Find!!! Before we knew it the week had come to an end and none of us was ready to call it a day! We had so much FUN we never wanted it to stop!!! But I knew I couldn’t wait any longer. I had to drop off the group and head to the Bahamas and I knew it was going to be a long day, Having FUN that is, before I cleared customs and I couldn’t wait to get started!!! . And just like I thought, it was wonderful! Wish you all could have joined me! It was just GREAT!!! Having all this Fun left me looking forward to this week. 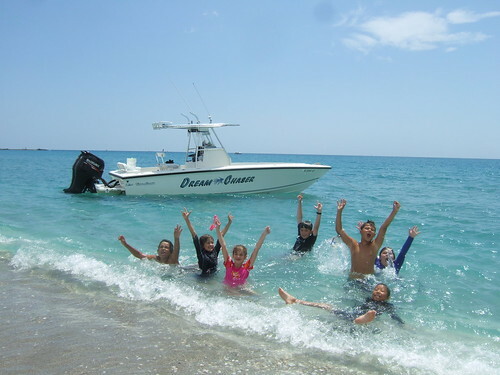 And one things certain, I couldn’t wait to head out in the boat with the kids and have fun doing it all over again! I know its going to be great! I can just feel it!!! Hope you’ll join us in the Adventure!!! Stay tuned, it will be here before you know it! Time Flies when your having FUN!!!! And we’re going to have it from start to finish!!! See you soon! Adventure Samantha had “The best time ever!” during this week at Adventure Camp. She wants to go to Adventure Mike’s camp again right now and she wants to go for a whole month next summer. Thanks Mike for such a wonderful experience and awesome pictures!